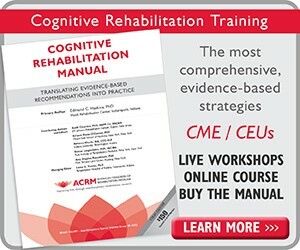 American Congress of Rehabilitation Medicine, P.O Box 896700, Charlotte, NC 28289-6700. Mailed registrations will be accepted through 30 September. After that date, please register by phone. BY FAX: Fax the completed Reg Form to ACRM: +1.866.692.1619. ACBIS Training Course and the RIC Lecture & Tour may also be purchased separately. STUDENT / RESIDENT / FELLOW: Attendees enrolled in an accredited school of medicine or approved graduate or under graduate program or fellowship in a medical rehabilitation discipline. Current ID required at registration check-in. EARLY CAREER: Professionals during first five years after completion of post-graduate studies. MEMBER: ACRM members enjoy savings on ACRM products and events, including annual conference registration. 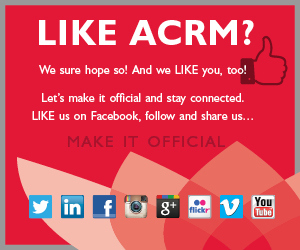 Visit www.ACRM.org/join to become a member and start saving. 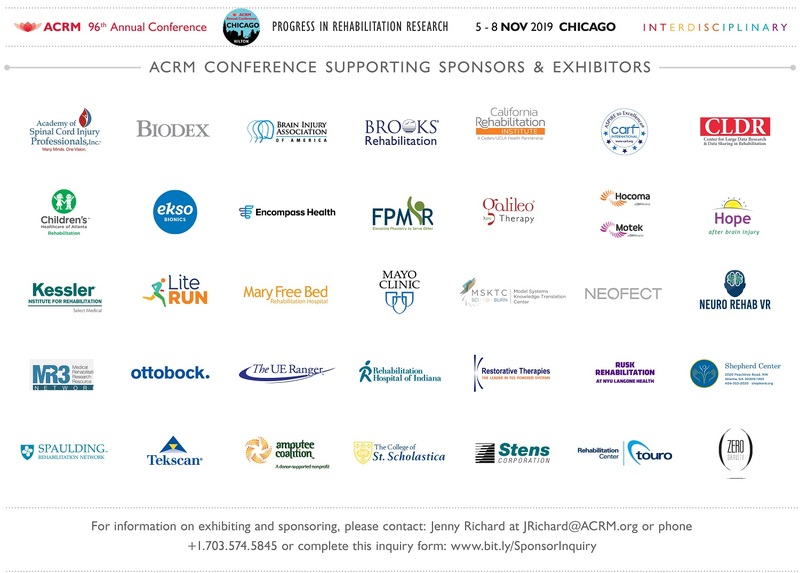 NON-MEMBER: Non-member registration includes an introductory 6-month ACRM membership, including access to all interdisciplinary special interest groups and networking groups, and discounted member rates on ACRM products and events. GROUP RATES: Groups of five or more may email Jenny Richard, ACRM Director Member Services at Jrichard@ACRM.org or phone +1.703.435.5335 to learn about special offers that may apply. 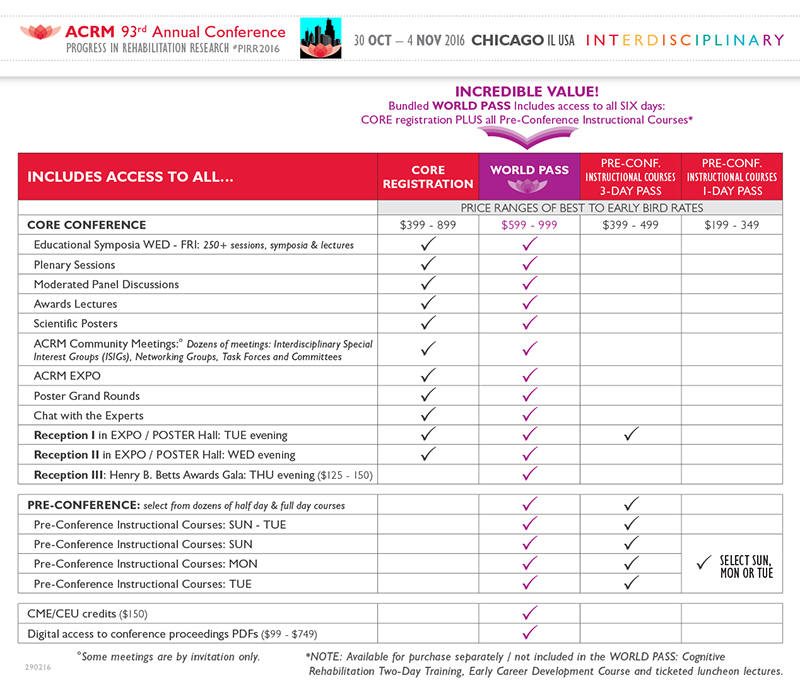 SPECIAL CIRCUMSTANCES: ACRM aims to keep the conference registration rates as low as possible so that attending is likely for the greatest number of people – to do the greatest good… getting the QUALITY research that matters to the people who NEED it the most — all in order to IMPROVE the GREATEST number of lives. 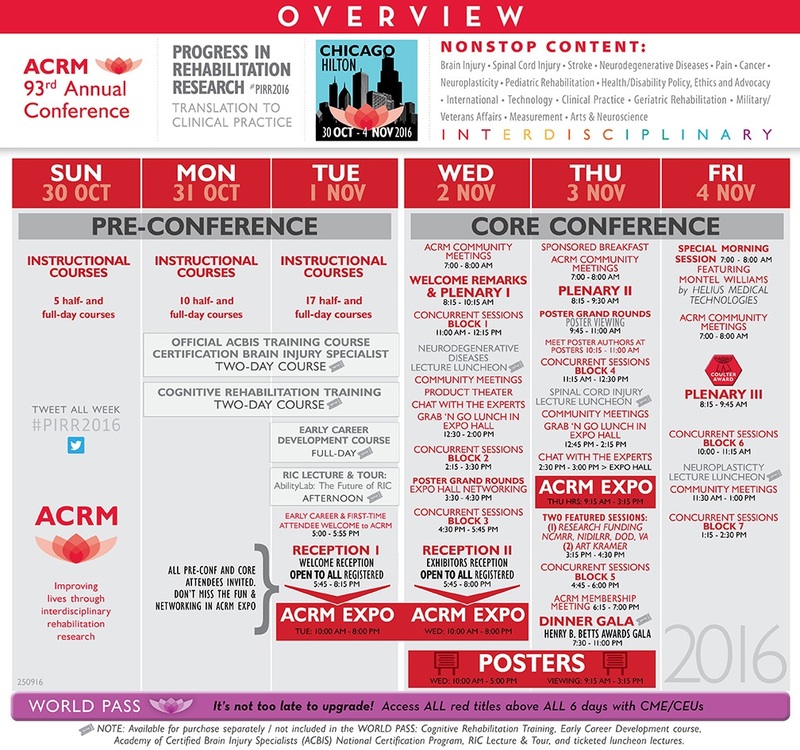 If your work depends on the research at ACRM to IMPROVE LIVES, you need to be at PIRR. If finances are keeping you from Chicago, ACRM wants to hear from you. Those wishing to attend from lesser developed countries (LDC) and individuals with special financial circumstances, such as unemployment, may email Jenny Richard, ACRM Director Member Services at Jrichard@ACRM.org or phone +1.703.435.5335 to learn about special offers that may apply. 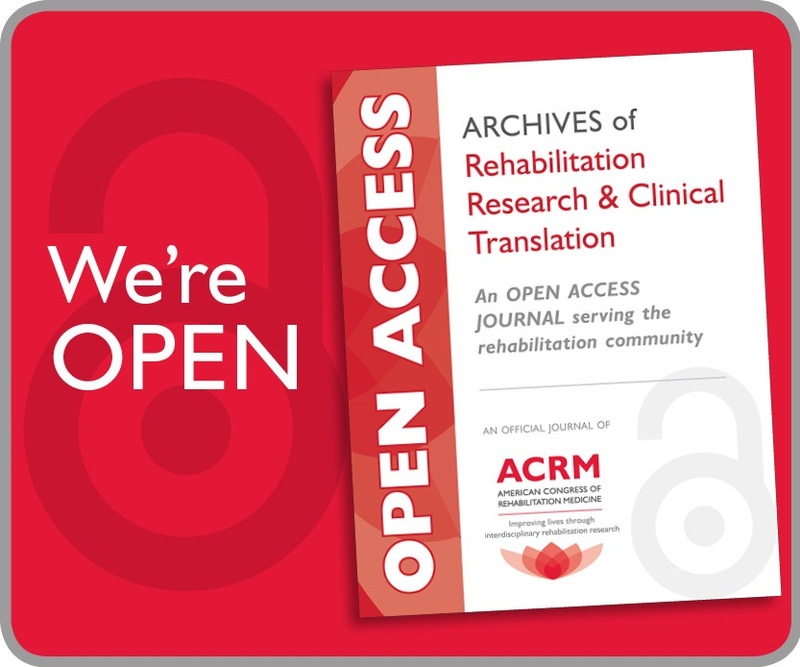 MEDIA/PR RATE: Members of the media and social media writers relevant to rehabilitation research may contact memberservices@ACRM.org for information on press entry and a limited number of potential social media/PR ambassador opportunities. 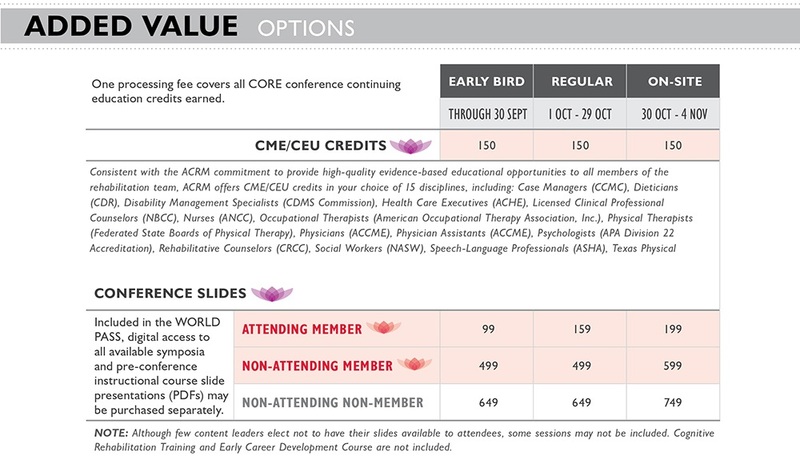 CME/CEU CREDITS: Recognizing that not all disciplines require continuing education annually, ACRM offers CME/CEU credits sold separately from conference registration in order to keep the point of entry cost as low as possible. 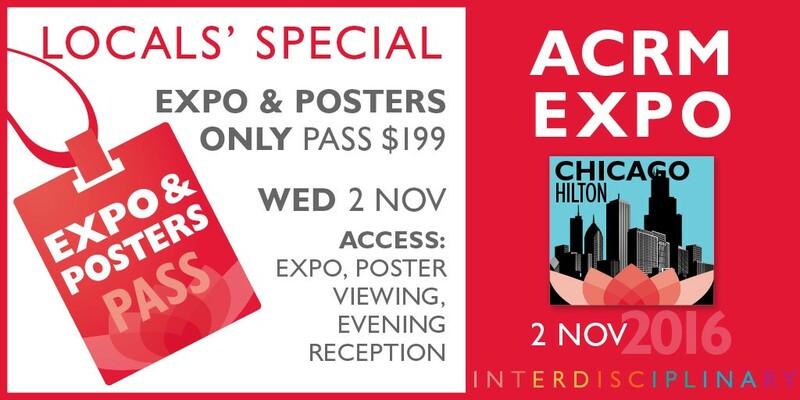 Only those attendees who wish to earn CME/CEU credit will incur this fee. Payment of this single processing fee entitles attendees to all continuing education credits for which they qualify. CANCELLATION POLICY: ACRM is a non-profit organization. Registrants wishing to cancel their existing registration to receive a refund must submit a written request to sbarrah@ACRM.org. A cancellation fee of $199 USD will be charged on all cancellations received before 31 August 2016. The balance of registration paid will be refunded. After 31 August 2016, a fee of $199 USD or 50 percent of registration paid, whichever is greater, will be charged and any balance refunded. If registration amount paid is less than or equal to $199, no refund will be given. No refunds will be issued after 1 October 2016, or for no-shows. Those who registered as non-members retain their 6-month ACRM membership. SUBSTITUTIONS / TRANSFERS: The original registrant will be charged a substitution fee of $199 USD and receive a 6-month ACRM membership. FORCE MAJEURE: In the event of a full or partial cancellation of the ACRM Annual Conference due to natural disaster or other force beyond the control of ACRM, ACRM will make a pro rata distribution of cancellation insurance proceeds applicable to registration refunds. COMPLAINT RESOLUTION: Any person may file a signed complaint about ACRM educational events with Kim Ruff. Complaints will be considered by ACRM. Complaints must be submitted in writing. The complaint must be identified as a complaint. The complaint must clearly describe the specific nature of the complaint, provide supporting data for the charge, specify the changes sought by the complainant, and identify the person making the complaint. ADA: Individuals requesting accommodation under the Americans with Disabilities Act (ADA) or any other special needs should contact ACRM at least 48 hours prior to the event at (217) 753-1190 (voice/TTY). PHOTO RELEASE POLICY: Attending the ACRM Annual Conference, Progress in Rehabilitation Research, constitutes an agreement by the attendee to permit ACRM to the use and distribute (both now and in the future) the attendee’s image or voice as captured in photographs, videotapes, electronic reproductions and audio files of events attended for the purpose of illustrating and promoting the conference experience. PAYMENT: If a credit card payment is declined, the registrant will be notified and an alternative method of payment requested. A $20 USD processing fee will be applied for returned checks and/or rebilling of a credit card. An additional $15 fee will be charged for payment accepted by Bank Wire transfer.